A better increase in W/SW groundswell yesterday with great clean 4-5ft waves across the beaches to the east through the morning before winds swung onshore, while the Surf Coast saw 3ft sets across magnets, best once the early morning high tide receded. This morning the swell has dropped back a bit with heavy fog across most locations, and clean 2ft+ waves on the Surf Coast, 4ft on the Mornington Peninsula. The swell will continue to ease through the day as winds persist from the north. Tomorrow is a lay day with the swell due to ease further as winds swing to the west. There'll be no decent size left on the Surf Coast which will be clean through the morning ahead of a gusty SW change early afternoon. Now, our tricky fresh pulse of W/SW swell for Sunday is still just that, tricky. 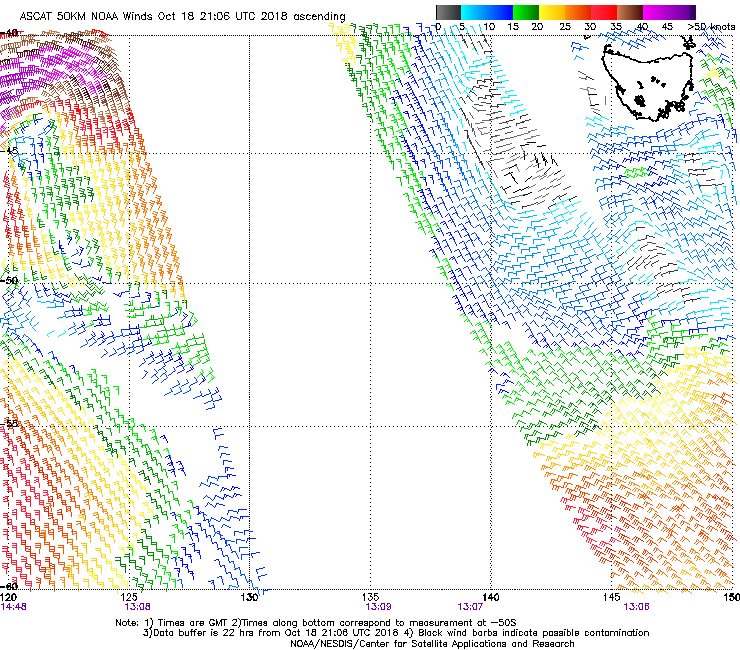 Yesterday afternoon a strong mid-latitude low formed south of WA, with satellite observations registering a burst of severe-gale W/SW winds, with some embedded storm-force barbs just within our western swell window. The low has since continued tracking east-southeast more into our swell window while weakening, generating a fetch of W/SW gales. The low will continue to weaken while dipping south-east today, leaving a moderate sized pulse of W/SW groundswell to travel towards us, arriving Saturday evening and peaking early Sunday before easing through the day. 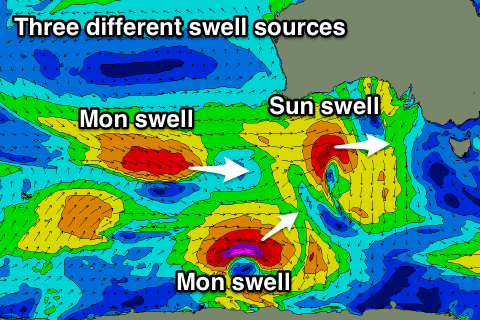 The swell will be very west in nature and small to tiny in protected spots on the Surf Coast, up to 3ft across exposed swell magnets, with 4-5ft+ waves due on the Mornington Peninsula. Winds look to be only favourable for the Surf Coast now, with a morning W/NW-NW breeze, tending S/SW and then S/SE into the afternoon though without much strength. Monday's better mix of W/SW and SW groundswells are still on track, as are the more favourable winds for exposed spots, with a strong polar low forming south-southwest of WA yesterday afternoon and evening, generating a tight fetch of severe-gale to storm-force W/SW winds in our south-western swell window. As this low weakens today, a great fetch of gale to severe-gale pre-frontal W/NW winds will move in from the Indian Ocean, under WA before quickly fading to the south-east, generating an additional W/SW groundswell. Both swells are due to fill in on Monday, possibly a touch undersized early (though unlikely) but alive and kicking mid-morning with sets to 3ft on the Surf Coast swell magnets and 4-5ft+ waves to the east. Winds should swing locally offshore through the morning with an approaching mid-latitude front, variable into the afternoon with weak sea breezes likely mid-late afternoon across both coasts. The mid-latitude front will move in on Tuesday bringing gusty W/NW winds as the mix of swells from Monday ease. Swell from this mid-latitude frontal progression is due to fill in on Wednesday and ease Thursday with multiple and tricky embedded pulses. Firstly a broad fetch of strong to gale-force SW winds will form in the wake of today's pre-frontal W/NW fetch, with stronger SW gales projected up and into WA, on the edge of our western swell window. This will produce an inconsistent small to moderate sized W/SW groundswell for Wednesday afternoon, easing Thursday. The remnants of this front will push through the Bight though, just within of our swell window before dipping south-east more into our swell window. Strong W/SW winds should be seen, with a possible core gale-force fetch, generating a building mid-period W/SW swell late Tuesday and more so Wednesday morning, followed by groundswell into later Wednesday and Thursday. Size wise we should see the Surf Coast coming in 3ft+ Wednesday morning, 5-6ft on the Mornington Peninsula with a further increase in size through the day, easing back from 3-4ft and 6ft or so Thursday. Winds look to be OK for the Surf Coast Wednesday morning and out of the W/NW, with a high moving in Thursday bringing N/NE winds. But we'll have to look at this whole swell event again on Monday. Have a great weekend! On Monday with two swells from different directions are we likely to see peaky beachies on the MP? I'd say no, because both are proper groundswells. Instead funky weird double up sets at times, which aren't ideal at all. Meh..... that was terrible. 1ft, maybe 2ft on the absolute bombs, inconsistant lazy dribble here in the west. Hopefully Wednesday morning will be better if were get an early land breeze. Stick to areas open to the swell if you're desperate today. 2/3 ft reefs is a long stretch. That late winter goodness seemed to scale down quickly this year. Nailed the forecast for today. Good fun chunky beachies. I forget sometimes how much fun a doubling up, steppy, rip bowl can be. Yeah today's swell wasn't expected to be that flash for the Surf Coast, tricky and west. 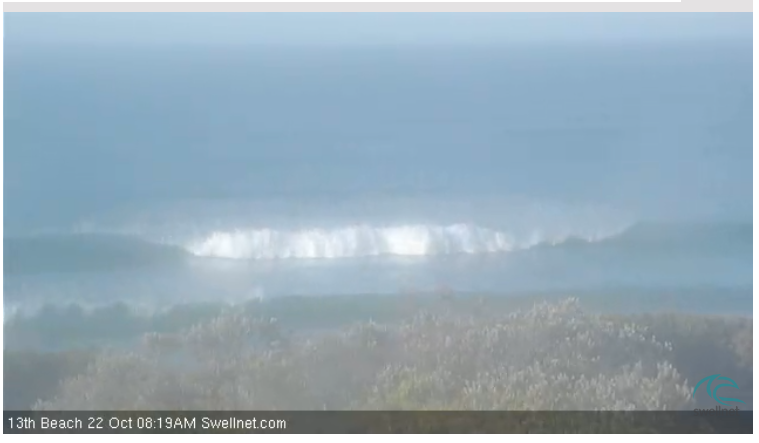 The camera needs a bit of a clean but those new swells are in! Yeh, the Fairhaven stretch was picking up 2-3ft, looked fun and glassy.